Deborah Aberg, Wayne Aberg, Joe Bierkortte, Brian Chase, Saundra Hall, Ron Macaluso, and Justin Shobe. Deborah, Wayne, Joe, Brian, Saundra, Ron and Justin join previous members Frank Hogan, Steve Graybill, staff and clergy. We also Welcome Nathan Reilly, our High School Youth Representative. ​To view the minutes of our Parish Council Meetings, please click on the Month. Have a Suggestion for the Parish? If so, use the Parish Pastoral Council Suggestion Box located on the Welcome Table. 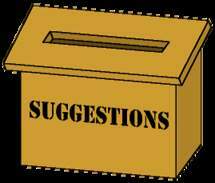 If you have a Suggestion, fill out the form located on the side of the box and place in the slot.